Toys nowadays seem to be so self-explanatory and automatic that the toys need toys to keep company. (Not sure if that made sense) Filled with blinking lights which I am strongly opposed to and a buttons that need power (i.e. costly batteries) to just function; I long for the good old days when a toy can simply be a toy. That means no buttons to push, no lights to blind your children with, and better yet, it can be a craft project that could be the next opportunity to simply be with your child. The crafty Socktopus is here to be the answer for those parents who long for the much simpler days (and toys). Friends of Socktopus are taking the concept of sock animals to a new level. Made out of old sweaters like the one your grandmother used to have; The DIY Socktopus kits turns them into a stuffed animal for your children to play with. However, it is recommended for children three and over since it does have buttons. A choking hazard for the wee ones. Friends of Socktopus are Eco-friendly because it recycles old sweaters and best of all, it’s made in the USA which guarantees that it’s Fair Trade. My only caveat is that its filled with polyester; I feel they could have used another fill that’s a bit more natural like hemp or even Eco-friendly bamboo; but I still love the concept regardless. I also really love the concept of building something together. 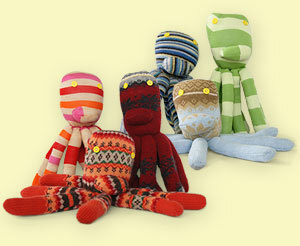 It can be a memorable for you to sew a Socktopus or one of his friends with your child. When time is a commodity and everything rushes by in a blur; taking the time to craft something together could be something you two can enjoy. I wish Layla was old enough so we can do this together. For the DIY kit, it is recommended for older children of ages 8 and up. And in celebration of Mother’s Milk Series, Eco Child’s Play is having a second giveaway. Two DIY Socktopus Kits. To read more about the Mother’s Milk Series Giveaway, just click on the link. Friends of Socktopus also has ready made animals such as the Sweater Owl, Punky Monkey Boy or Girl, and Deluxe Socktopus which is made out of two different sweaters so you get one of a kind. For those busy or perhaps Craft challenged moms; these are for you.